Winning starts at your beginning. And your first hours are where the great heroes are made. Own your mornings and you'll master your life. The 5AM Club is Robin Sharma's masterwork, blending his original insights into legendary leadership, uncommon creativity and exponential prod... read full description below. Winning starts at your beginning. And your first hours are where the great heroes are made. Own your mornings and you'll master your life. 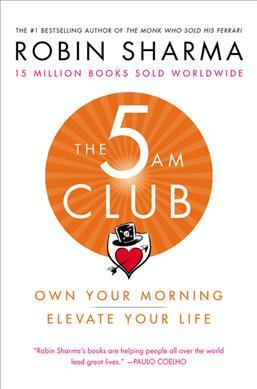 The 5AM Club is Robin Sharma's masterwork, blending his original insights into legendary leadership, uncommon creativity and exponential productivity with battle-tested tools to help you produce work that allows you to dominate in your field--while you live a life that inspires the world. ROBIN SHARMA is a globally respected humanitarian. Widely considered one of the world's top leadership and personal optimization advisors, his clients include famed billionaires, professional sports superstars and many Fortune 100 companies. The author's #1 bestsellers such as The Monk Who Sold His Ferrari, The Greatness Guide and The Leader Who Had No Title, are in over 92 languages making him one of the most broadly read writers alive today.